Today we had annular solar eclipse which was unfortunately not visible from my location. Here we had a simple partial eclipse. 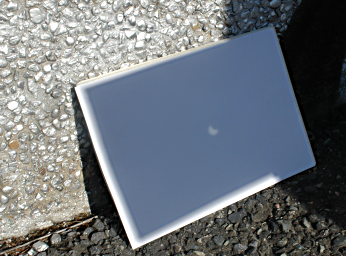 As it is way to dangerous to look directly into the sun to see it, I used a cardboard square with a hole in it to project the sun's eclipsed disc on a projection screen mode out of white paper. For more pictures, see the gallery .